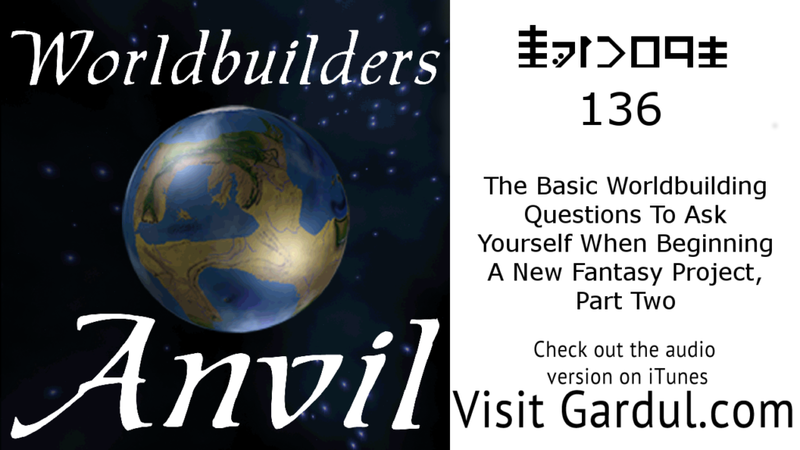 In episode 135, we started building a starting inventory for creating a fantasy world. We asked a few general questions about starting a new fantasy world. Questions about the night sky, the differences between your world and earth, and of basic geography and natural wonders of the worlds. If you have not had a chance to begin the world starting inventory, please click here. When creating my naturalistic fantasy framework world, I created a basic rule for how to develop my world. I started with beliefs and common language and then figured out the migration paths for those early cultures. I then evolved the cultures in different locations based on the various types of geography and new experiences that affect the peoples. Due to the inability to communicate over time the cultures change. And do to the different experiences and given enough time the changes can be extreme. Now, it might sound complicated; and it can be difficult. It is as hard as you make it. The trick is not to try and be logical. Be inspired for the change you want and make it happen. It will not always be logical; even the Vulcans are not entirely logical. If you see, one culture per state merge the areas it’s okay. If you are a linguist and want to create cultures from languages, do it. Change the order. Just know the process you want to follow. It will help you figure out what is next. And remember the starting inventory is not a contract it is a guide. If you have exceptions in the order you use, if there are inspirations that you decide to ignore, or if you only want one religion for all your states it is fine. Ultimately, it is your world. Join Michael and I as we explore the specific question you should ask yourself as you start a new world. And when you finish, remember to share out the episode. Heck, you can do better than that. You know two people who could use this podcast to help them in their world building adventures. Share it with them, and if they do not know how to get podcast take a moment and show them. You will not only open them up to our sure; you will show them a great way to finding a new way to find great content! Are there religions, languages, races, cultures, states, and faces that you have created that you want to exist in your world? How many races exist in your world? Any god(s) that you know you want to affect your world? What real world, Earth, inspirations are you starting with? Complete a starting inventory for your fantasy world. Make focused sprints of work with small breaks during the day, called the Pomodoro Technique. Check out this episode of Small Biz Life Podcast for more information.